David Caro. Guitarist. 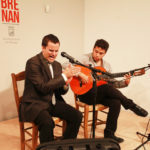 Despite his youth, he has accompanied great flamenco figures such as El Pele, El Carpeta, Farruca and Juan Pinilla. He has travelled with his music to countries such as Turkey, Mexico, U.S.A., Italy, and France. He has won several important prizes, including the Desencaja Contest of the Regional Government of Andalusia. Nowadays, he works in the cast of the famous tablao Los Gallos de Sevilla.